The unofficial and illegal pattern of Israeli strikes, the double-faced public attitude of the Israeli leadership as well as the unwillingness of Syrian and Iranian forces to admit any damage and casualties caused by Israeli actions hinder efforts to get a real assessment of the effectiveness of the IDF military campaign. Taking into account that the IDF provided little details even into officially declared strikes, this breeds grounds for wild media speculations and rumors. On the one hand, Syrian and Iranian media demonstrate a classic example of “there were no casualties” coverage. On the other hand, US and Israeli media, and sometimes even official Tel Aviv, time and time again destroy almost entire Iranian military infrastructure and even Syrian air defense system, which then mysteriously resurface by a next Israeli strike. Despite this, the jets and weapons list employed by the IDF against targets in Syria are an open secret. The core of the Israeli Air Force striking force is the F-16I Sufa. This warplane is a modified variant of the F-16D block 50 and 52 fighter and ground attack aircraft. The F-16I, which has a crew of two, differs from the original F-16 by modified avionics and weapons systems. The F-16I is fitted with a pair of removable conformal fuel tanks provided holding 450gal of extra fuel on both sides of the upper fuselage. They increase the aircraft’s mission range and combat endurance. The fitting of conformal tanks makes the two wing inner store stations normally used for external tanks available for weapon carriage expanding the warplane’s air-to-ground weapons capacity. The F16I is fitted with a dorsal avionics compartment, which extends from the rear of the cockpit to the fin and houses additional avionics systems, chaff and flare dispensers and the aircraft’s in-flight refuelling receptacle. Among other equipment, the F-16I got the Elbit Dash IV display and sight helmet system, mission and presentation computers, and digital map display. The jet navigation system includes a combined ring laser gyro inertial navigation system, global positioning system (RLGINS/GPS) and a digital terrain system. The F-16I has the Northrop Grumman AN/APG-68(V)9 multi-mode radar, which reportedly has 5 times the processing speed and 10 times the memory capacity of the previous APG-68 radars on the F-16. There were 102 F-16I Sufra in service with the Israeli Air Force until February 2018, when the Syrian military shot down one of these jets. It was the first occasion on which Israel lost a jet to an enemy combatant, since 1982. At the same time, there still has not been a comprehensive evidence to confirm that any of F-35I of the Israeli Air Force (IAF) has been employed in combat ever. Claims by Israeli officials that some F-35I was employed somewhere and somewhen cannot be considered as a reliable proof. The prime striking weapon used by the IAF is the GBU-39 Small Diameter Bomb (SDB). Vestiges of these bombs are often being found on sites of the Israeli strikes. In particular, GBU-39 SDBs were employed on March 28 when the IAF targeted supposed Iranian targets in Aleppo city. The GBU-39 SDB is precision-guided glide bomb developed to provide aircraft with the ability to carry a higher number of more accurate bombs. The GBU-39, which was first introduced by Boeing in 2006, has a standoff range of more than 110km due to its pop-out wings. The 250lb (113.6kg) bomb uses an inertial navigation system (INS) and GPS to hit static targets with high accuracy, although it has only 22.7kg of explosives. Another GBU-39 advantage is its stealthy signature. The bomb has a length of 1.8m and a diameter of 0.19m, but its radar cross section of 0.015m2 only. This creates additional difficulties for enemy air defense systems in the event of a massive strike with the usage of GBU-39 bombs. In September 2008, Israel receives approval from the US Congress to purchase 1,000 bombs. 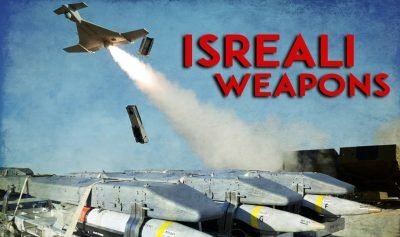 Israel was the first country outside of the US to receive the weapon. In the event of massive strikes on Syrian air defense systems and alleged Iranian targets, like ones in May and February 2018, and January 2019, the IDF employs a wider list of weapons. For example, the widely-covered destructions of Russia-supplied Pantsir systems of the Syrian military, airstrikes were supported by a massive usage of ground-launched IAI Harop loitering munitions.The IAI Harop is an anti-radiation drone that can autonomously home in on radio emissions. The munition can either operate fully autonomously, using its anti-radar homing system, or it can take a human-in-the-loop mode. If a target is not engaged, the drone will return and land itself back at base. Thanks to a small radar cross-section, the IAI Harop is intended to target enemy air-defense systems in a first line of attack and can evade SAMs and radar detection systems, which are designed to target much larger aircraft or to intercept fixed-trajectory missiles. It has a flying time of 6 hours and a full range of 1000 km. The IAI Harop has a weight of 135kg, a length of 2.5m and a wingspan of 3m. Unlike other drones that carry explosive warheads, the Harop itself is the main munition with an onboard explosive of 23kg. Taking into account a wide economic and military support from the US and its coalition, the Israeli military enjoys a relative freedom of operations and has almost an endless stock of offensive means to engage Syria and its Iranian allies in this kind of individual air attacks, which it is currently being employed. A military technical advantage over the Syrian Armed Forces allows Tel Aviv to employ its strike policy almost without suffering real consequence. However, incidents like one in February 2018 demonstrates that this advantage is not something fully irresistible. Over the past few years, Damascus has achieved a visible progress in training and strengthening of its air defense forces, first of all thanks to Russian support. A relatively low efficiently of Israeli strikes on Syria, especially in comparison with the picture provided by pro-Israeli sources, is a demonstration of this. At the same time, modern Syria has no means and resources to repel a wide-scale Israeli aerial operation, if Tel Aviv make a fundamental decision to fully suppress Syrian air defense forces. The issue is that military and diplomatic cost of this “success” that Israel will have to pay for this may appear to be too big. Therefore, the current status quo will remain unchanged in the near future and the IDF will continue to make separate strikes on alleged Iranian targets, which will face limited responses by the Syrian Air Defense. This puts Russia, which is a key Syrian ally in the sphere of the military technical cooperation, in a complicated situation. So far, Moscow has limited its response to Israeli actions to diplomatic steps, a widely promoted S-300 delivery and a declared modernization of the Syrian air defense network. This “limited” response was predetermined by a role of “neutral force” ready to work with all sides to de-escalate the conflict, which Russia seeks to play in the region. This attitude has weak sides. Currently, most of Syrians see the Russians as heroes and allies that had helped to reverse the course of the war. Nonetheless, the Russian inaction in response to Israeli actions, especially amid the low intensity of military actions on key frontlines, undermines this image. If the situation develops in this direction, in 2-3 years, Russia may lost the hard-won support from the Syrians. In this event, and especially in the event of a lack of success in other fields, Moscow may find itself operating in a very different environment on the ground.